Pot enthusiasts packed San Francisco’s Golden Gate Park on Saturday for an unofficial celebration of marijuana, leaving behind a mess that city officials now say cost more than $15,000 to clean up. About 15,000 people gathered in the area known as Hippie Hill on the eastern end of the park throughout the day, said Connie Chan, spokeswoman for the city’s Recreation and Park Department. The first celebrants showed up in the morning with tents, coolers and barbecues—as well as bongs, pipes and joints—and the crowd continued to grow until the event culminated in cheers and a massive smoke-out at 4:20 p.m. while youth soccer games carried on nearby. Previously: 4/20′S 10,000 Lbs Of Trash: Could We Learn From New Orleans? The informal gathering, held annually on April 20, was much larger this year than in recent years because it fell on a weekend day that was warm and sunny, Chan said. The large crowds participating in the cannabis festivities left behind a big mess for city workers to clean up, Chan said. She said dozens of workers spent eight hours on Sunday, with some having to work overtime, to clean up about five tons of trash in the park. Some volunteers taking part in the city’s Earth Day celebration also helped in the cleanup. Loewenberg said as the day wore on, many of the celebrants streamed onto nearby Haight Street. No major crimes were reported at the event, although eight people were arrested for narcotics sales, six were arrested for being drunk in public, about 30 received open container citations and three people were placed on mental health detentions, said police Capt. Greg Corrales from the department’s Park Station. Chan from Rec and Park said about 120 parking violation citations were also issued as well as three for public urination and one for unpermitted amplified sound. Loewenberg said his group wants the city to require celebrants to seek a permit to gather in the park on April 20 in future years. “The only way such a celebration should be held in Golden Gate Park is if there’s an organizer, like any other event, who goes through the process of getting the permits and approvals, and we have the city collect fees for use of the park in that way,” he said. “It’s just unfair that the taxpayers are the ones that get stuck with the bill,” he said. 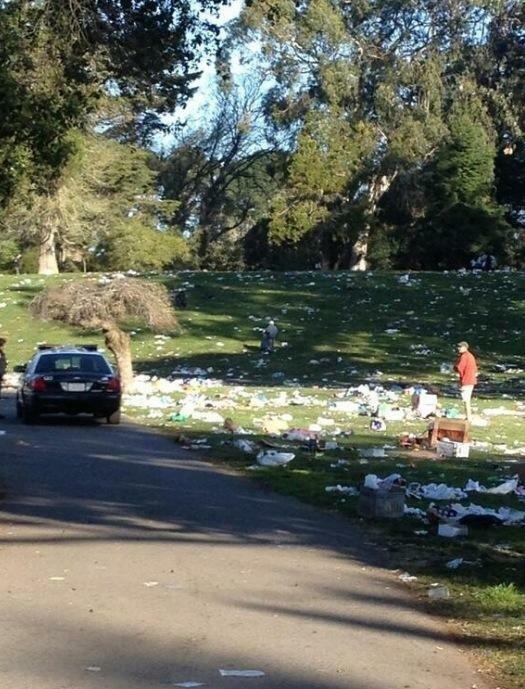 The mess left in the park was a hot topic on social media sites, with one person writing on Facebook that people should simply clean up after themselves at the event.